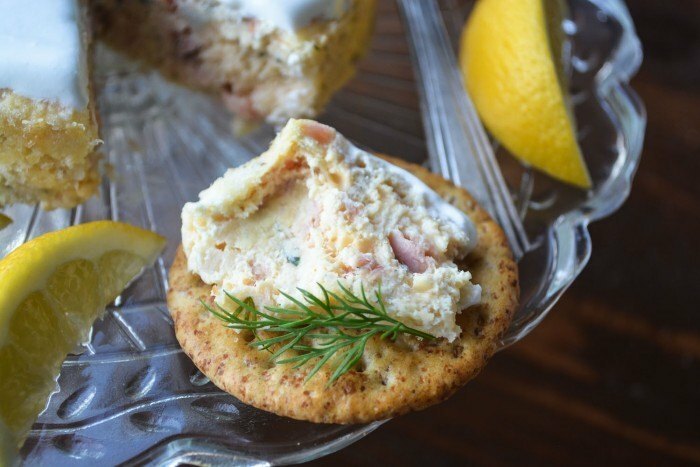 This Savory Smoked Salmon 'Cheesecake' is a unique and delicious appetizer for any occasion, it's guaranteed to be the hit of the party! Butter 2 small cheesecake pans (mine are 4.5 inches in diameter) and wrap the bottoms and sides with foil to prevent leakage in the water bath. Mix the bread crumbs with the tablespoon of cheese and dill, use your fingers to lightly toss them to combine. Coat the bottom and sides of each pan with the mixture. Sprinkle any remaining crumbs along the bottom of each pan. Meanwhile melt the butter in a skillet and saute the shallots for about 5 minutes until they are translucent. Set aside to cool. Put the cream cheese in the bowl of a food processor and run the machine briefly to soften it. Blend in the eggs and process until well combined. Add the cooled shallots, smoked Gouda, dill, salt, and lemon juice to the bowl and pulse several times to combine. Add the smoked salmon to the bowl, breaking it up into large chunks as you add it. Pulse the machine a few more times, just until everything is well combined but not pureed. You want a little bit of texture in the mixture. Divide the mixture evenly between the two pans, smoothing over the top with a flat knife. Set the pans in a baking dish. Pour an inch or two of hot water into the baking dish to form a water bath. Bake the cheesecakes for about 50 minutes, or until they are no longer jiggly in the center and the tops feel firm. Let the cheesecakes cool before removing them from the pans and 'frosting. Make the sour cream topping by whisking together the sour cream and lemon juice. Spread over the top of the cooled cheesecakes. Decorate the cakes with some sprigs of fresh dill and tiny blossoms. Serve with crackers and lemon wedges.